The X-men have been going into outer space for almost as long as there have been X-men. The far reaches of the Universe were the perfect get-a-way for the mutant who wanted to leave behind the prejudices and hatreds of home and take on some simple, old-fashioned adventures. In the spaceports and cantinas spread across the far-flung galactic arms, everyone is an alien outsider and no one blinks twice at blue fur. The Dark Phoenix was born and died in outer space and it was there they discovered both the noble Starjammers and the malevolent Brood. It was in the pages of the X-men that one of the great Marvel alien races, second only to the Skrull and Kree, the Shi’ar were created, including Deathbird, Gladiator, Emperor D’Ken, and Lilandra, the greatest and most tragic love of Charles Xavier. With this sort of lineage, clearly there should be lines around the block every time the X-Crew travel beyond low earth orbit, but it turns out to be harder to get lightning to strike twice than Back To The Future would lead you to believe. 1.21 gigawatts, indeed. In recent years, Joss Whedon’s Breakworld adventure did manage to capture a bit of the interstellar magic, but Ed Brubaker’s The Rise and Fall of the Shi’ar just meandered from one of end of the cosmos leaving half its characters as lost as the reader. This has led some to question whether our merry mutants can thrive away from their sentinels, schools, and days of future past. Are those great X-Men space operas exceptions that prove the rule? 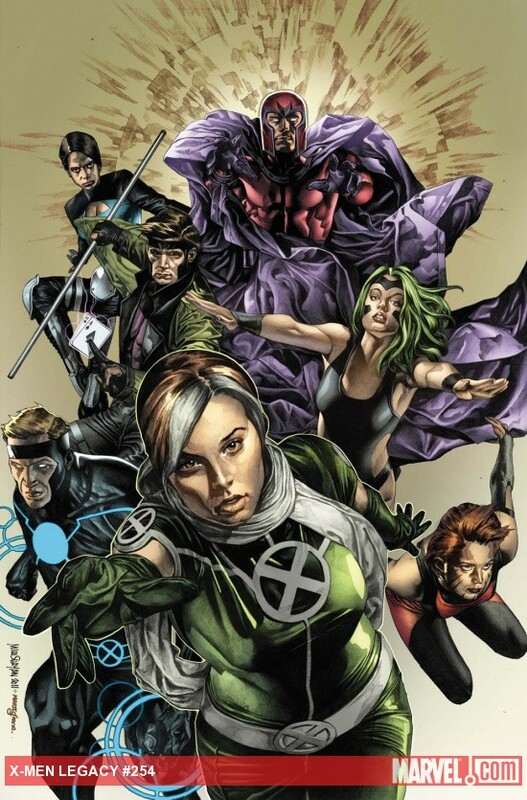 Now several years have gone by since the X-men abandoned Havok, Polaris, and Rachel Summers on the far side of the universe. Admittedly the X-men have been busy with all their messiah complexes, wars, and comings, but finally writer Mike Carey and penciller Steve Kurth have gotten around to rescuing our wayward X-bunch. Rogue absorbs a bit galaxy-scale teleporter from Legion and off we go: the X-men are back in the Shi’ar empire. The story is immediately engrossing. We are dropped into a war torn space station on the other side of the universe. There are ill-defined factions, a band of rogues clearly over their head, and the looming threat of complete annihilation if everyone doesn’t get off this station before it is sucked into its sun. Both our band of rescuers – Magneto, Gambit, Frenzy, & Rogue – and their intended rescuees are split and scattered across the station. So they have to puzzle out what is going on, find each other, find the missing X-men, and get out of Dodge before everything gets blown to atoms. And, of course, most of the locals first order of business is to kill them. Mike Carey seems to have a great handle on these characters, even to the point of making me like Frenzy, a character previously known for liking to punch things. She still does, but now she also drops lines describing the local “picturesque battle damage”. I especially liked the scoundrel Sovel Redhand and his reprobate crew. Lots of funny moments, like when poor Horse has to keep searching for booby traps, but Carey manages to also give the group a real edge of desperation. They are all trapped together on a sinking ship. Some of the sci-fi talk is a bit forced, with too many references to overly futuristic terms like “cycles” or “data-bursts”, but most of the dialogue is very good and crisp. Steve Kurth’s art is also excellent. He really excels at the close-up and does a great job on the bug aliens, the Grad Nan Holt. When he pulls back the camera, he does gets a bit more suggestive and gestural, leaving out some detail. I think it works well with his style, but it could irk some people who really hate it when background characters lose their facial features. So clearly it is too early to declare that Carey has cracked the X-men space nut. I thought this was a fantastic start. Don’t worry if you haven’t read any of the recent cosmic stuff or Brubaker’s run. If you have never heard of the Shi’ar before, I might spend two minutes checking their Wikipedia entry, but really there is no reason not to jump right in. The characters have basically fallen down the rabbit hole (literally, there are three-eared rabbits there) completely unprepared and hopefully the fun will be in finding our way out together. Tagged with: Frenzy, Gambit, Havok, Magneto, Polaris, Rachel Summers, Rogue, Shi'ar, X-Men Legacy.